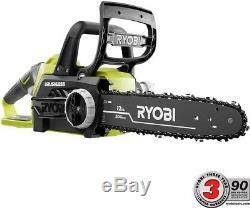 Ryobi Electric Hand Chainsaw 18-Volt Lithium-Ion Cordless Brushless (Tool Only). The Ryobi ONE+ 18V platform of cordless tools is raising the bar with the Ryobi ONE+ Lithium+ 18V Brushless Chain Saw. Bar and chain, this chain saw will clean up unsightly branches and limbs in your yard. With tool-less chain tensioning and an automatic oiler that keeps your chain lubricated, using a chain saw has never been easier. Brushless motor technology provides superior power and durability to get the job done. The Ryobi ONE+ Lithium+ Brushless Chain Saw redefines the 18-Volt category by delivering the power and performance you'd expect from higher voltage lines with a lightweight and compact design, making operation comfortable for every user. Theres never been a better time to upgrade or start your ONE+ collection. California residents: see Proposition 65 information. Works with all Ryobi ONE+ tools and batteries. Brushless motor for increased performance and runtime. Bar and chain oil not included. : 12 Chain Size: 12 in. : 10 Battery Amp Hours: No Battery Battery Power Type: Lithium Ion Battery Size: 18-volt Battery/Charger: Tool Only Chain Pitch: 3/8' Chain Speed (mps): 9.0 Chainsaw Size: Small Chainsaw Type: Hand Chainsaw Charger Included: Charger Not Included Drive Links: 45 Features: Automatic Chain Oiler, Brushless Motor, Tool-Less Chain Tensioning Filter Type: No Filter Gauge. 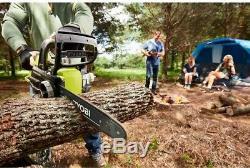 043 Handle Type: Rear Handle Chainsaw Included: Chain, Scabbard Power Type: Battery Product Weight lb. : 9.0lb Refurbished: No Torque Maximum (Nm): 0.0 Usage Type: Homeowner Chainsaw Voltage (volts): 18 Certifications and Listings: 1-UL Listed. Our stock all ships from our US-based warehouses. The item "Ryobi Electric Hand Chainsaw 18-Volt Lithium-Ion Cordless Brushless (Tool Only)" is in sale since Friday, June 29, 2018. This item is in the category "Home & Garden\Yard, Garden & Outdoor Living\Outdoor Power Equipment\Chainsaws". The seller is "1962tms" and is located in multiple locations. This item can be shipped to United States, Canada, United Kingdom, Denmark, Romania, Slovakia, Bulgaria, Czech republic, Finland, Hungary, Latvia, Lithuania, Malta, Estonia, Australia, Greece, Portugal, Cyprus, Slovenia, Japan, China, Sweden, South Korea, Indonesia, Taiwan, South africa, Belgium, France, Hong Kong, Ireland, Netherlands, Poland, Spain, Italy, Germany, Austria, Israel, Philippines, Norway, Bahrain, Croatia, Malaysia, Chile, Jamaica.